Every last Thursday of the month I like to run a different RPG to broaden my group's horizons and make use of the boatload of game I own. This Thursday, by popular demand, is Tunnels and Trolls, so as can be expected I'm incredibly excited. However, I'm not quite sure what I'm going to run yet. I could write a short adventure but I have a lot on my plate this week with video game reviews that I'm not sure if I'd have to time. So I turn to you, fair readers. What adventure do you suggest I run that will preferably take an evening, but it doesn't really have to. I returned from my long weekend in Edinburgh a few hours ago after spending a good chunk of the day on the train. My girlfriend and I had a great time, even though she was sick last night, and we got to see some things that we hadn't seen in our previous trips. I'm going to Edinburgh today, so I'll see you all on Sunday. After the premiere T&T game with my regular group last week I asked them individually what they thought and I didn't get the response I was expecting. I knew they seemed to enjoy it, but I didn't think that they enjoyed it THAT much. After all, their usual game is 4e D&D, which is a far cry from the mechanics of T&T. However, I was pleasantly suprised when they told me they loved it and 'have to play again soon'. I don't know why I doubted it - it's the best RPG ever, but I didn't know whether it would be their bag, what with the non-tactical combat and the funny spell names. But it looks like they've been bitten by the bug. What suprised me more is that they liked it that much and it was an adventure that I winged there and then. What will they think when I run a written module by the great T&T trolls? Awesome will ensue. First off let me say that I'm delighted to have some new followers on the blog, many thanks for taking an interest in my nerdy ramblings. Now to business. Last week I finished playing through an official Wizards of the Coast 4th Edition adventure called King of Trollhaunt Warrens. I really didn't enjoy Dming this and my players, although they had fun, were very critical of the module. This was the first adventure that saw the characters into paragon, since I wanted a break from writing. It's also the first in a trilogy of adventures that get PCs up to epic level. I don't think I'll be running the subsequent two. The real problem for me and my players is that it's far too encounter heavy. This may be fine for those who want hack hack hack all day long, but for the roleplayers out there, there is very limited scope to roleplaying. The dungeon is pretty much encounter after encounter, broken up by a return to a town that's been invaded, which has some pretty cool encounters in it, but then coming back to the warrens that are basically stocked full of the same creatures. Whilst the writer did make use of in-combat hazards such as flaming pits and flammable oil, there was very little in the way of traps. I also can only recall two skill challenges, which is pretty bad considering it took (an edited) 7 weeks to complete. In the end, it was a bit of a drag. Yes, there's an insane amount of loot to grab at the end, which made the players's eyes light up with glee, but there wasn't a whole lot of substance. Today I continued the campaign with a new adventure. I winged it since I had no time to write but I felt it went quite well. I included an encounter with a Fen Hydra, a puzzle skill challenge and lots of lovely roleplaying to boot, making it fairly balanced. Ok, the story was a bit poor - fight hydra, go find mage who supposedly summoned it to destroy town, but at least it was interesting. Born under the Black Sun, Fleshgorgers are the minions of the Winterdemons. They prowl the dark chasms of the world where dark magic is prevalent and attack delvers with their great maws. Special attack: 5 spite causes Breaker Breaker to be cast. Special features: 10 bone armour. TrollCon has been a staple in the T&T calendar over in the States and I've always been jealous of all who attend. However, this year that is to change with the first ever TrollCon in the UK! Woo! On the evening of the 5th and all day on the 6th November, we will be having a gathering together of Tunnels & Trolls players at the first ever TrollConUK. All are welcome, and if you'd like to join us we will be at the Menzies Strathallan in Birmingham; easily accessible by bus, train and car, and with plenty of accomodation around. Any of you who have been to the UK Games Expo should be familiar with the place! Because of the cost of the room, at the moment the price is going to be £20 per person, however if we get more than enough people we will lower the cost of admission. There will be plenty of good freebies, and a few competitions. As well as Tunnels & Trolls there will be the opportunity to play OgreOcre (Ken St Andre's T&T related card game) and Alf Seegert's Bridge Troll board game, and potentially Monsters! Monsters!. Friday evening will mostly be socialising in the bar, meeting up and playing T&T related games. Saturday will be the con proper, with games running all day in our own room. Unfortunately it seems that Ken won't be there as far as I know, but it will be a great time nontheless. I'm going to be there, so you should come too. I especially love the fact that Dwarves build 'show cities' above their underground metropolises so people won't bother trying to enter their real domain. The great Trollgod himself has begun writing a detailed history of significant events in Trollworld and it's seriously cool. Go check it out at his site. Some good inspiration for adventures here methinks. So today I introduced my regular gaming group to T&T. I wasn't sure if they were really going to get into it since we usually play D&D 4E, which is their preference (I really love it too). But it turned out really well, even though I improvised the whole thing. The set up was simple enough. The delvers: Aslar the Dwarf warrior, Blue Fairy the, err, Fairy, and Tucan the Ranger, had been living it up in Khazan after a series of profitable delves. Four days in word came from eastern traders that a great dragon had landed in the hills close to the trade route. The government immediately put out a 900 gold reward for anyone who could kill the dragon, so naturally the players jumped at the opportunity, along with an arrogant NPC called Blob. Off they went to find the dragon, first winding along the main trade road and eventually passing through Kobold Swamp (original, no?) The unlucky dwarf fell foul of a Kobold pit and had to be helped up with a bit of hemp rope (an introduction to saving rolls) before continueing, only to be stopped by a group of spear and sword weilding Kobolds (didn't see that coming did you?). After failing to convince the Kobolds that they were going to help the dragon (using their knowledge of the D&D kobolds who serve dragons, which is rubbish in my world) they were attacked. The creates were swiftly vanquished and the party headed deeper into the swamp, all the while Blob proclaiming that he killed the Kobolds single-handedly. Eventually the group came upon five leprechauns who were sitting in a circle chanting. Blue Fairy fluttered up to them and cheerfully said, 'Hi'. The leprechauns seemed rather friendly and using my best Irish accent I told the players that they were just raising a demon because, well, it's Tuesday. The delvers didn't like this at all so attacked the leprechauns (each one named after a character in The Big Bang Theory). Blue Fairy, excited about all the spells he could use, struck one with a Hold That Pose as it was chanting to summon the demon. The leader was the first to fall but the second round saw a Demond (lesser-demon) pop into existence. I told the players that this was a very powerful foe and that they needed to try and be creative to overcome it. Aslar flung campfire embers into its eyes, sending smoke billowing around it, boscuring its vision. Then Tucan threw his chakram into the Demond's eyes before Blue cast a spell to kick up dust around the remaining leprechauns. After that they ran like hell. Raise a glass of ale and sing a birthday tune for it's Andy 'Boozer' Holmes' birthday today. Andy is a titan in the T&T world, running The Hobgoblin's Tavern and writing awesome adventures that are well worth your hard-earned cash. So many happy returns, chum. Drink the tavern dry. Today marks the 9th anniversary of a day when religion reinforced its role as the poison of the world. Too little praise goes out to the service people of the fire department, many of whom selflessly sacrificed their lives in order to save others. Don't even think about thanking a god for those who survived these dreadful attacks. Instead, thank these infinitely brave men and women for being more than any of us could ever be - heroes. Few weapons in the icy realm of Blashyrkh can top the might of the Frostdemon Deathaxe. The deadly weapon was created by Tilliad, a great sorceror who bound the frostdemon Marg into a warrior's axe and cast into the Chasm of Eversorrow. It is said that Marg still lives on in the axe and is still capable of great power. Special: Marg Unleashed - If 5 sixes are rolled Marg is able to take control of the axe and cast Whammy, tripling the dice rolls on this weapon for this round of combat. It's a harsh and painful reality that we can will no longer see Gary Gygax or Dave Arneson again. To us these imaginative men are the cornerstone of our noble hobby - they were legends in life and legends in death. The thought of the possibilty of meeting Gary or Dave was enough to make any roleplayer dizzy with excitement and now there is no chance of speaking to them is saddening in the deepest sense. However, some people forget that one of, if not the biggest inspiration in roleplaying games still walks among us; his massive troll feet creating tiny earthquakes wherever he roams. I am of course referring to the Trollgod himself, Ken St. Andre. 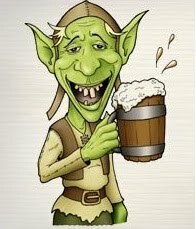 Most people reading this blog will already know who this fine gentletroll is. For those who came in late, Ken is the creator of Tunnels and Trolls as well as a slew of other games. A retired librarian, Ken created arguably created the second ever roleplaying game (and some, such as myself, would say the best). Having been acquainted with Ken myself, I can affirm the opinions of many who say that he is a kind, funny and charismatic guy who always has the time to speak with his fans. Granted, and Ken would testify, he doesn't have the gargantuan fanbase that Gygax had, but Ken's followers are some of the best roleplayers and people you could meet. He really likes to get in with T&T fanatics, being one himself, and talk openly and candidly with them. This is a special trait for a game designer to possess and one that few nowadays can honestly say they have. I encourage everyone reading this to do one thing. Write to Ken with your thanks for doing what he does. Tell him that you appreciate his work. Write a blog post about your first T&T session, or about the time you met Ken at a convention. Thanks Ken. You're a hero and an inspiration. Long may you be rule Trollworld. Awesome picture belongs to the equally awesome Atroll. There can be no doubt that gazing upon a dungeon map littered with colourful miniatures is impressive and a wonderful part of our hobby's aesthetic. However if you lack a regular group to adventure with then this glorious image will likely be a rarity for you. As solo adventures stand, they usually contain fantastic artwork, normally by evergreen T&T artists like Jeff Freels and Simon Tranter. The images combined with well-crafted description make for a fine quest that is played out almost entirely in ones imagination. But adding miniatures into the mix builds another level of interaction that comes close to emulating the feel of a multiplayer session. Firstly, having a painted miniature of your current character is enough to spark the imagination. You can see the kind of clothing she wears and the colours she is adorned in. Even if you can only use a non-painted figurine at least you have something tangeable that represents your character. Secondly, enemies come to life. You can see the expression on the Withlord's face as he hurls a bolt of dark energy at your character. Rooms and locales are rarely discussed in terms of exact shape, so you have free reign over their designs. You could even draw in the detail as explained in the body of the text: a bookshelf here, a bearskin run there. This all serves to heighten your solo experience. That is not to say that you won't run into any practical problems when undertaking such an adventure. For instance, you will have to move enemies, but as the solo will not usually dictate where and how the creature moves it's likely that you will only keep them in one position while you move your own delver around. However, a representation of where your character is in relation to an enemy can be beneficial, as it denotes whether you are close enough to get a good shot with an arrow or whether you are likely to send the missile whistling past the monster. There is certianly no harm in trying out a solo with miniatures. The main problem you will find is that setting up is time consuming and tends to break up the adventure when you are drawing a new map out as you move to the next chamber. It is always easier to just pull the book off your shelf and go at it, but if you are in the mood to add a little spice to your solitaire game with a little effort then you will be in for a visual treat. Marching through the endless frozen tundra, the Black Orcs of Winter's Bite are the maurauders of the white wasteland. As nomads they travel, seeking food and, most importantly, riches. Often Black Orcs descend into the great caves of Urambish where they find fortune or death. Females of the species are granted positions or power within each tribe, such as Chiefsmaiden or Warlord. Males traditionally craft weapons and armour whilst the women head out to seek adventure in the many hidden tunnels of the world. When they are ten years old, Black Orc children are sent into the Howling Wilds to fend for themselves. If on their 11th birthday they return to their tribe they achieve the position of Warchild. 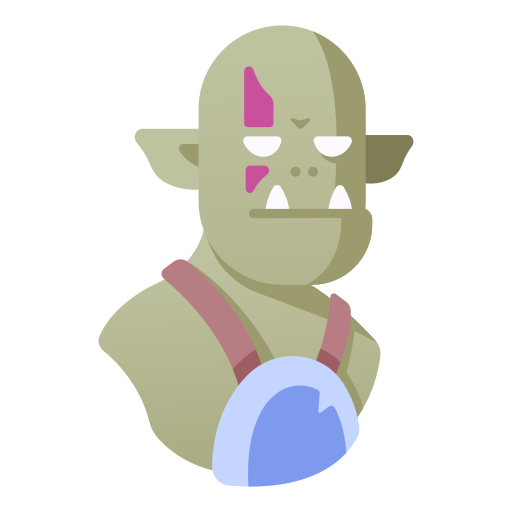 Snowtreaders are the most common kind of Black Orc. They are trained in scouting and survival in the harsh climate, carrying handaxes in case they are leapt on by a Saberwolf. Clad in chainmail and grasping an Orcen Scimitar, the Guard is a keen fighter. Snowtreaders are usually promoted to Guard once they have proven that they can handle themselves in a brawl. Special attack: 3/Winter's Cry - The Warlord's battleroar is enough to shake even the mightiest of warriors. Delvers within a 20ft radius must make a L2SR on CON. If failed delvers take 1d6 CON and cannot act in their next turn. Special attack: 4/ Poisoned shot - Chiefsmaidens are famed for lacing their arrows in poison from the deep trees. Those hit by the arrow (roll randomly to determine who if multiple attackers) suffer 2d6 CON damage and 3 CON damage every turn until the end of combat. Chiefsmaidens and Warlords are masters of combat. While Warlords lead thier troops into battle, Chiefsmaidens stay back and pick off unlucky targets with poisoned arrows. It's been a fair while since I updated Trollish Delver, so I thought now would be a good time to get back into the swing of things. Just because I've been away doesn't mean I haven't been having fun with my delvers. No sir! Although I have been a rather busy bee over the last few months with many things on my plate and unfortunately the blog has taken a back seat. But I return, and with awesome news! 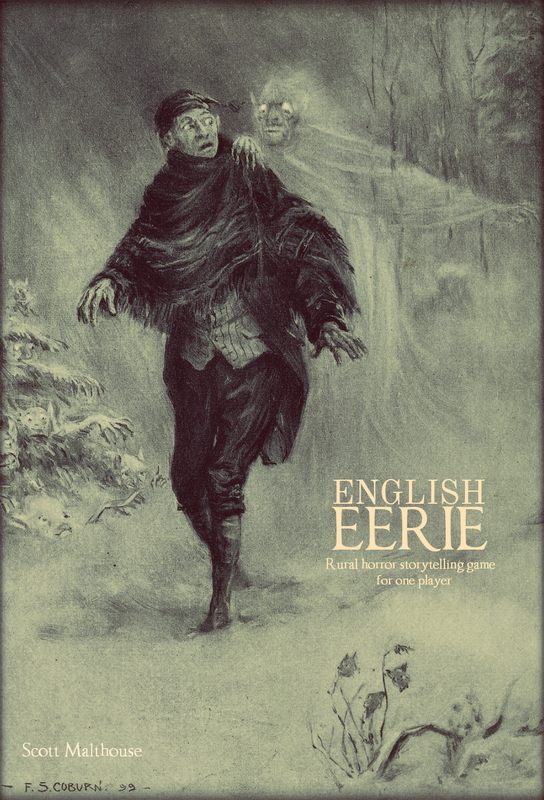 Peryton Publishing maestro and friend Tom K Loney has asked if I would write an introduction to the second issue of Elder Tunnels, a T&T magazine that launched this year. If you haven't read it, go buy it, because it's a wonderful resource for the best RPG in the multiverse. I'll be following in the massive, rocky footsteps of the Trollgod himself, Ken St. Andre, who introduced the cracking first issue. Intimidating? Hell yes. Tom, you rock my friend!